I was going through my old game boxes and I stammbled on one of my favourite games of all time. 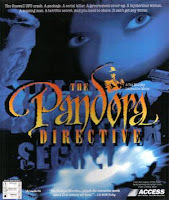 Pandora Directive. I had not played this since when it came out in 1996 and I was really in the mood for a good detective story. There are few that can compare to Tex Murphy, private investigator. Simple as that I badly wanted to play it. Unfortunately the game comes in 6 CDs and it is made to run on DOS or Windows 95 and requires some very tedious fiddling around to make it play without requiring to switch discs. Fortunately for me GOG has bundled it in one nice package that is ready to play on modern PCs for an excellent price. That was it. I downloaded the game from my GOG account and sunk in the P.I. world of Tex Murphy. 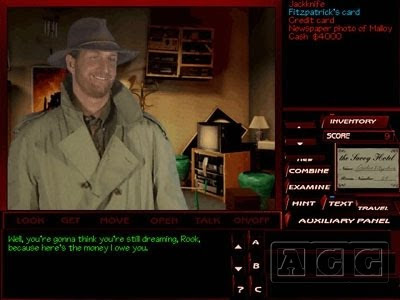 The game is an FMV adventure meaning that real life actors are used for the game's cut scenes and graphics. The acting is very good and it includes names such as Kevin McCarthy, Tanya Roberts, Barry Corbin and of course Chris Jones as Tex Murphy. If you played Under a Killing Moon(another great Tex Murphy adventure) you would have noticed that the direction, filming and acting was not of great quality, but in this everything is top notch. Tex Murphy is a very likable lad. Life has not been good to him and he always finds himself in trouble. His life is just like an old fim noir movie but that's they way he likes it. He is a mixture of Humphrey Boggard and Indiana Jones with more humor and less looks. Always broke, always down, he is street smart and in search for a new job, women and whiskey. The story of the game starts when a customer aproaches Tex and asks him to find a long lost friend. Tex being broke as usual will accept the job and his search will lead him in a series of murders, goverment conspiracies and alien encounters. Without wanting to give anythign away this one is one of the finest plots in any adventure game. Our hero, Tex Murphy P.I. The best quailty of the game, apart from the story, is the way the gameplay is woven around the story. You will never have illogical puzzles that were simply thrown there for the sake of the game. Everything has to do with the story and all riddles and puzzles promote the plot further. This is a challenging game though. The game features an in-game hint system which is very helpfull without giving much away. It can be played on two levels: one for normal play and one with extra puzlles and no hint system. Puzzles are a mixture of inventory based ones and standalone mechanical riddles. The graphics are very good even for a game of 1996. They are 3D and you can move around everywhere and search for items and clues. The video quality is nice and thankfully its doesn't use the interlaced technique that was usual in the games of the time. The soundtrack is very pleasant with blues and jazz tunes setting the tone. The story takes place in a span of 9 days(plus 1 for the ending) and the game is very generous as with its playtime. It will take you many evening to finish this one. The game features 7 different finalles depending on how you played the game. All in all this is an excellent choice if you are after a great adventure and truly is one of the greatest games that were ever created. The series includes Under a Killing Moon, Overseer and the first two Tex Murphy games, Mean Streets and Martian Memorandum. All are available from GOG. 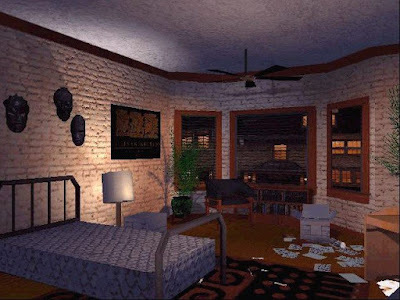 It is too bad that Microsoft bought Access Software just to buy the Links golf simulator (that Access created) and shut down the Tex Murphy games. I would really love to play a new in the series but I don't see this happening. Oh well. Get yourself a bourbon turn the lights off and enjoy one fine detetive story.